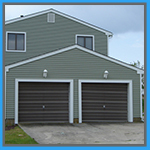 Dr. Garage Door Repair Berkeley is the leader in providing expert garage door installation for home or business locations in the greater Berkeley area as well as surrounding areas. It doesn’t matter if you have a current door that needs replacement (and we can assist with its disposal), or if you’re looking for a custom door. Our expert installation team is to help you every step of the way, from the second you call us until we leave the premises after installing your garage door that works flawlessly. We’re here for you and we won’t stop until you are completely happy with your new door! You can either choose from one of our wide array of doors incluidng doors made by manufacturers such as Clopay, Wayne Dalton, and 1st United Door Technologies, or we can custom a design a door to your specifications. Regardless of the direction you want to take, we’re right there with you and we won’t leave until you’re satsified! Call us now at (877) 203-9708! 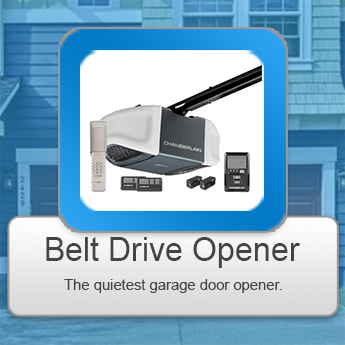 When you choose a new garage door, you’ll need to consider the garage door opener that will work best with your door. We can take you through the process of not only choosing the garage door opener that’s right for you, but also provide expert installation. We’ll make sure that the door and the opener work in tandem to provide you with smooth, safe, and flawless operation! If you need a new opener for your new door or a new one for your current door, contact us today for more information! Belt Drive Openers are popular due to their nearly silent operation. Select models have a battery backup system that activates in the event of a power outage . 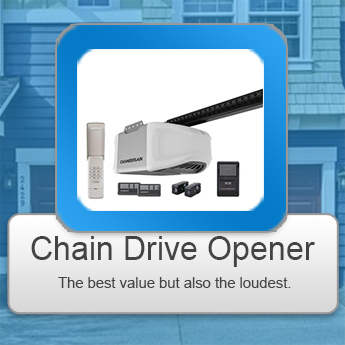 Chain Drive openers are the most popular of all the garage door openers. They’re the cheapest, but there’s a tradeoff … they’re also the noisiest. 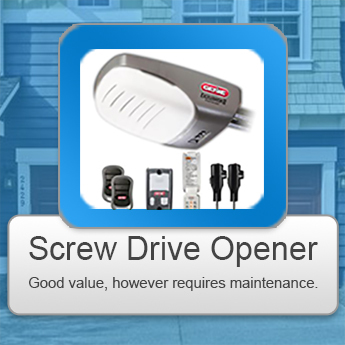 Screw drive garage are fantastic because they’re virtually maintenance free. They’re also very cost efficient, and work well with heavier wooden doors. 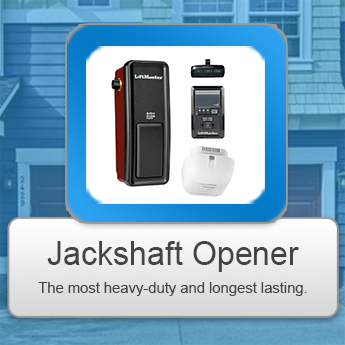 Jackshaft Openers are great for businesses because they’re mounted on the wall next to the garage door and don’t intefere with garages with low ceilings. Garage door springs are crucial and mandatory for the operation of your garage door. They assist in creating a counter balance system to assist you with lifing the door. There are two types of garage door spring, torsion and extension.. They last a long time, depending on the weight of your garage door as well as seasonal conditions; they don’t tend to last as long in humid areas as opposed to other areas. We don’t recommend you try and repair or replace your springs, due to the force exerted by the springs. 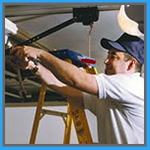 Leave it to the certified professionals at Dr. Garage Door Repair Berkely to address your garage door springs issues. For more information, call us now!